There’s a grandeur in Andalucía that pervades everything from its ancient architecture to its spectacular landscape. Encompassing the southernmost tip of Spain, this is the country’s second largest autonomous community, sprawling along the Mediterranean coast. Moving to the rhythm of flamenco, Andalucía – also known as Andalusia – is a region that’s quintessentially Spanish but, thanks to its incredible geography and proximity to North Africa, has a personality all of its own. The beautiful cities of Malaga and Seville are both popular bases for exploring this glorious part of Spain – and with car hire, it’s so easy. Start planning your adventures with this guide to the region’s 15 greatest sights, experiences and curiosities. 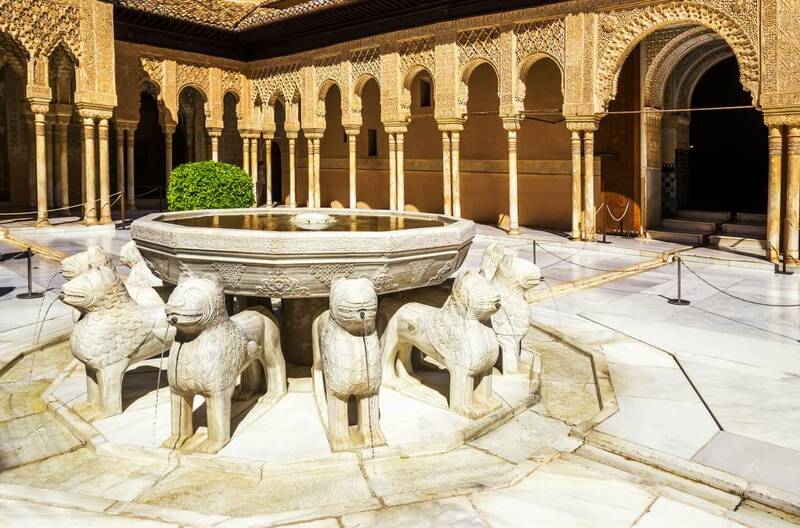 The first references to the construction of the Alhambra in what’s now the city of Granada date back to the 9th century, but it’s thought that its earliest incarnation may have been standing in Roman times. Explore the palatial luxury of this red-tinted fortress, from the Patio of the Lions and intricate mosaics, to grand columned entrances and the Hall of the Boat. It’s essentially a standing testament to Europe’s relationship to Moorish culture across the best part of two millennia – a marriage of Arabic and Western traditions. Flamenco was born in the gypsy culture of Andalucía, and Granada is the best place to see it for yourself. The Sacromonte caves, just uphill from Granada’s historic quarter, offer a unique setting to watch the impassioned explosion of colour and emotion as flamenco dancers show off their skills. Right around the corner from the Alhambra, it’s a great way to round off a day of sightseeing. Providing the dramatic backdrop to the city of Granada, the Sierra Nevada’s snow-capped peaks merit a couple of days of exploration. Hire a car and explore these scenic roads, weaving in and out of the shadows of the mountains and lapping up the beautiful landscapes. The national park is broken up with thundering rivers, sheer gorges and magnificent glacial lakes, while the gentler foothills offer cultivated terraces of almond trees and vegetables. Intimate villages sit quietly in the nooks of the mountains, inviting you to stop and enjoy some refreshments on your way. 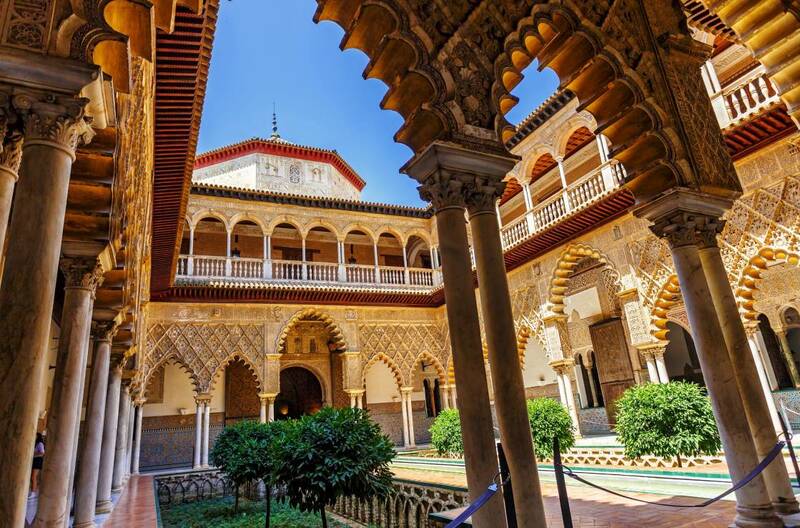 This UNESCO-listed Alcázar of Seville complex is a spectacular fortified palace that has evolved over the years to incorporate elements of Mudéjar and Christian architecture. It began life more than a thousand years ago as a fort – but has been redeveloped many times since. In the 14th century, King Pedro added the jewel at the heart of the complex, the beautiful Palacio de Don Pedro. Underground, the Baños de María de Padilla are waiting to be explored – soaring stone Gothic vaults which glow softly in the golden sunshine. The Alcázar gets bonus points for its use as a Game of Thrones set, too. Hailed by many as one of the greatest pieces of Islamic architecture in the world, the Mezquita – also known as the Mosque of Cordoba – is a vast space which gleams in lavish shades of red and gold. This beautiful complex is dominated by the sprawling Abd ar-Rahman I's mosque, hailing back to AD 784. There’s also a beautiful cathedral at the heart of the space, which was added in the 16th century. Explore the courtyards, towering columns and archways. Climb to the top of the Bell Tower to see this religious sanctuary from above, and go back after sunset to watch the light show projected on the ancient buildings. Pre-dating almost everything else on this list by around 5 million years, the Nerja Caves lie in wait under the mountain foothills. The towering, awe-inspiring space feels like a cathedral carved by the forces of nature. Observing the caves’ magnificent rock structures and subtly shifting colours, it’s easy to feel a kinship with the stone age hunters who inhabited them just a moment of geological time ago. The world’s most acidic river, the Rio Tinto, begins its journey in Andalucía’s Sierra Morena mountains. A vibrant mix of red and orange, the waters look otherworldly, thanks to the extremely high levels of iron and heavy metals. Weirdly, despite its incredibly hostile environment for life, micro-organisms called extremophiles thrive in the river. Best leave your swimsuit at home, though, this is one for looking at rather than swimming in. 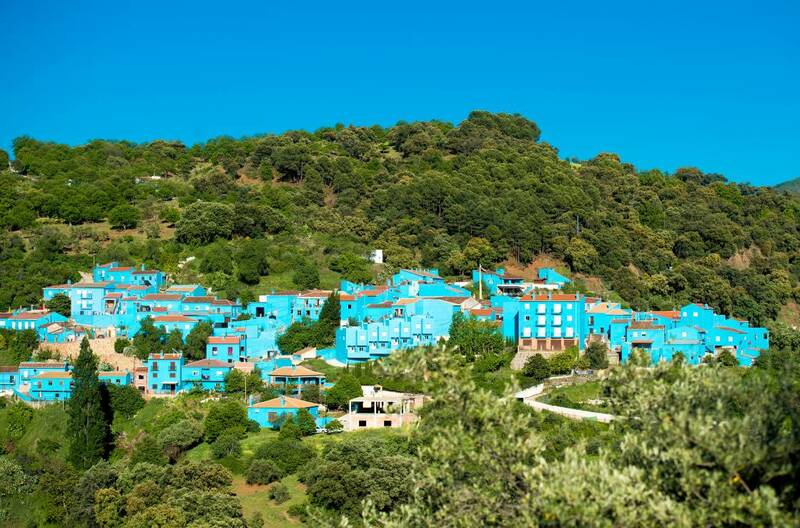 One of the most curious sights Andalucía has to offer is Júzcar, the so-called ‘Smurf village’ in which everything from the houses to the church is a fluorescent shade of blue. This isn’t an anachronistic term slapped on a place that’s always been this way – in 2011 Sony used 4,000 litres of paint to change the colour of the village to celebrate the release of The Smurfs movie. It was supposed to paint it back white afterwards, but the locals voted to stay blue. You can do all the things you’d expect in a small Spanish village – explore local shops, relax in sun-kissed cafes – with the added novelty of being in Smurf land. This museum dedicated to Picasso in Malaga – the city where he was born – is one of the great monuments to the master’s work. It includes upwards of 200 Picasso pieces, from early classical paintings to the cubist masterpieces which cemented his name in history. The Museo Picasso Malaga, housed in the 16th-century Buenavista Palace, spans his career and also hosts other exhibits on a revolving basis. The sandy town of El Rocío feels like a slice of the Wild West right here on the continent. For most of the year, it’s quiet – horses plodding through the streets, locals gathering in white-washed cafes. But that all changes in the spring. 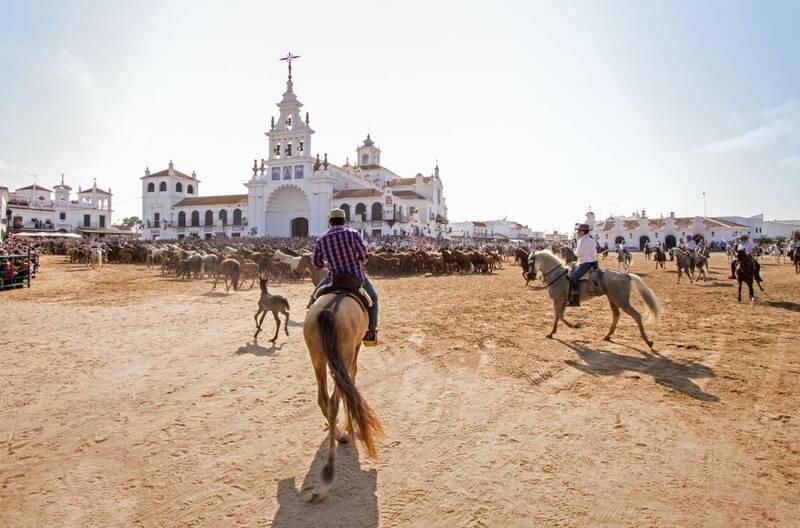 Every May a million people descend on El Rocío for a feria that dates back to the 13th century when, according to local legend, a hunter found a statue of the Virgin Mary in a hollowed-out tree trunk. The festival is an explosion of colour, with many travellers arriving in extravagant outfits and ornately decorated gypsy-style wagons. For a change of pace, relax on the beautiful beach at Punta Paloma, where the sand is soft and the water is clear. This headland six miles north of Tarifa separates the massive beaches of Tarifa from those of neighbouring Bolonia – but is itself an unspoilt slice of paradise. Dominated by colossal 100-metre-high sand dunes that engulf whole trees, this stretch of coast is one of Andalucía’s most pristine places to unwind. You can even cap off your day with a natural mud bath at the beach’s westernmost end. One of the most famous cities of the dead in the world, this ancient Necropolis dates back to the 1st and 2nd centuries AD. In the period, hundreds of tombs – many of them elaborate complexes of multiple chambers – were carved into the rock, along with animal statues standing guard at the entrances. Incredibly, you can walk around and explore these ancient tombs. Located right in the heart of the town of Aracena, the so-called ‘Grotto of the Marvels’ is an extraordinary network of caves and tunnels. Make your way through each of the 12 wonderfully-illuminated chambers, where rock formations look like artistic masterpieces and subterranean lakes are as clear as glass. It’s a chance to step, quite literally, into the heart of Andalucía. Located on the coast of Andalucía’s province of the same name, Huelva City is the place where Christopher Columbus launched the voyage that would lead to Europe’s discovery and colonisation of the Americas. Step on board replica ships which are docked around the city and pay a visit to the victorious statue of Columbus, flag in hand, in Las Monjas Square. This UNESCO-recognised site is one of Europe’s largest natural wetlands – a complex system of marshes, channels, lakes, pine forests and reserves that hosts thousands of rare birds and the endangered lynx. The area is also home to moving dune systems, 15 miles of unspoilt white sand and the towering fossil dunes of the Asperillo. It’s difficult to narrow down the experiences on offer in Andalucía. It’s a region that doesn’t scrimp on spectacle, and it seems like history oozes from every stone, dune and city. You could easily lose yourself for weeks touring this incredible part of Spain, and it would keep rewarding you for doing so. Hire a car in Malaga or Seville to explore it all in total comfort, encompassing incredible architecture, natural wonders or blissful relaxation in one of the most beautiful places in the world.